EcoStinger story started from fascination with enjoying the sun, beach and outdoor activities while keeping safe around the clock, The name EcoStinger refer to both the environment (eco) and the ultimate swimsuit that can provide full body protection (stinger suit) hence the name was born "EcoStinger". The desire to fully enjoy the outdoor environment while respecting mother nature lead us to create an eco-friendly product that can withstand the sometimes harsh outdoor elements such as UV radiation, Jellyfish and man made chlorinated pools. EcoStinger including logo design and artwork is a registered trade mark in USA and Australia; The business is globally active across several continents with distribution and fulfillment warehouses located in America and Asia for faster shipping and better delivery time. EcoStinger products include special chlorine resistant fabric that is made of Polyester/PBT which is superior and more durable than all other swimwear material worldwide; No Chemicals or treatment applied to fabric to enhance its UV protection or elastic ability, it is the quality of the yarn and the way fabric is structured and knitted that give EcoStinger fabric the technological advantage and edge over other swimwear materials. Fabric offer UPF50+ UV block, is chlorine resistant, quick drying, snag resistant, revert back to its original shape after each use, maintain color and elasticity even when used in chlorinated pools, light weight keeping skin cool during hot weather conditions. EcoStinger products designs are simple yet carefully crafted to give you the perfect snug and comfortable fit in addition to a stunning flattering look. EcoStinger fabric colors are rich, vibrant and daring with special contrast color combinations that stands out from the crowd. EcoStinger produces excellent quality sun protection swimwear and UV clothing products with UPF50+ featuring UVA and UVB cover; Each garment is exquisitely made for individual and professional needs with exceptional features and value; perfect body fit; Protection against Jellyfish stingers, sea lice and other sea creatures; Most products include Chlorine resistant fabric which function perfectly in chlorinated pools without losing elasticity and colors; Fashionable colors and design suitable for all members of the family; Fast delivery worldwide; Growing affiliate network servicing customers worldwide. EcoStinger offer Satisfaction Guarantee. EcoStinger overall satisfaction rating is 5/5 stars as voted by online customers. click on this link to view all comments and reviews. Products available on this site are exclusively produced, labelled and owned by EcoStinger and/or associates brands. Products are shipped within 24 hours using efficient fulfillment services based on shipping destination and option selected. For more information about shipping and returns, please visit Shipping & Returns page. ECOSTINGER® fabric provide high sunblock rating of UPF50+ (blocks >97.5% of the sun UV radiation). ECOSTINGER® fabric is made from superior yarn characteristics; Chlorine Resistant proof; Retain colors and elasticity; Excellent stretch and recovery revert back to its original shape; Breathable: release body heat and sweat; Water repellent; Soft - feels like second skin; Quick drying. ECOSTINGER® is committed to green environment; preserving the environment we all share has become a necessity and we are proud to be committed to this project. 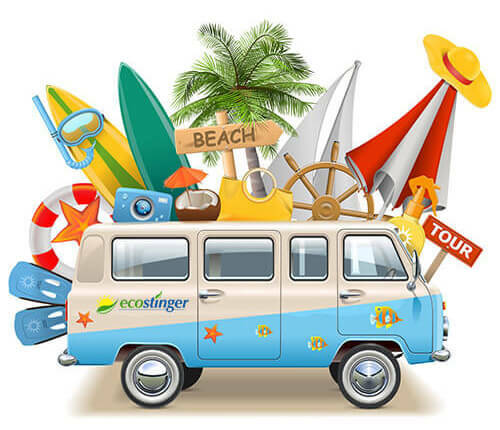 ECOSTINGER® styles, designs and colors are made for many uses such as swimming, surfing, boating, jet skying, cycling, jogging, sailing, fishing, all type of outdoor sports and hobbies. Designs provide excellent skin protection from uv radiation, yet fashionable and comfortable enough to cater for all body shapes, personal needs and different use. ECOSTINGER® offer Paypal and 2Checkout (2CO) payment services for secure transaction processing. No data or financial records stored by ecostinger.com, you can rest assured your financial transaction through PayPal and 2Checkout is confidential and secure.